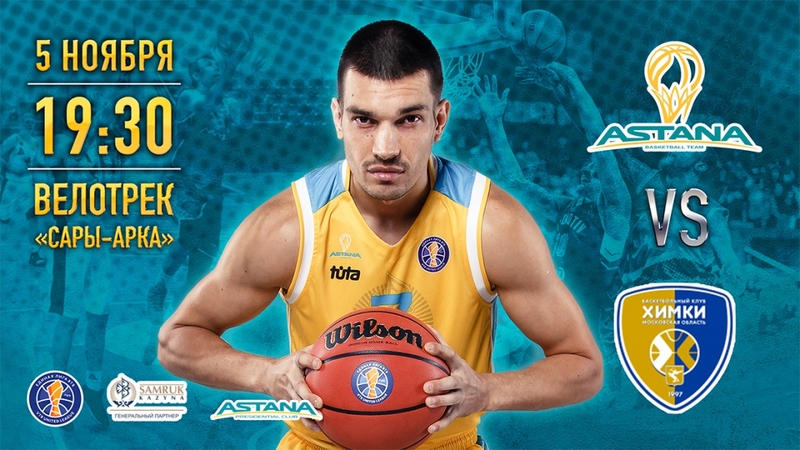 On Monday, November 5, «Astana» Basketball Club will hold a home match in the framework of the regular VTB United League championship against «Khimki» from the Moscow region. «Khimki» - is a Russian professional men's basketball club from the Moscow region, founded in 1997. In addition to participating in the VTB United League, it performs in the Euroleague. Chronicle of the past game: «Khimki» participated in the VTB United League since 2009. The Kazakhstani club played 14 times with the Russian team, where Astana players beat the titled opponent three times. Standings: «Khimki» Basketball Club takes the second place in the standings with the result — 5 wins in five games. «Astana» stands fifth with the result — 3 wins and 1 loss. The head coach of BC «Astana» — Emil Raikovich: “Khimki» is one of the best teams in Europe and in the VTB league. The game against a team of this level gives us another opportunity to check our level and our physical form at the highest level. They have a very strong roster, including the entire bench. We will do our best, as we have done in all the previous games”. The game will take place on November 5th at the arena of Saryarka Cycle Track, beginning at 7:30 pm Astana time. Online ticket purchase on Ticketon.kz. Detailed information about the tournament, tournament tables, schedule and results of the matches are published in the section Tournaments.